only the very best care and grooming for your dog. with a 100% satisfaction guarantee or your money back. Monday to Saturday and will take your call till 8:30pm daily. I will personally groom your dog so both of you can fully relax during your VIP pet grooming experience. What’s more… I never double book, which means your dog will not see the inside of a kennel or be locked in a room full of stressed out barking dogs waiting for grooming or pick-up. Only all natural, bio-degradable shampoos and conditioners are used because they are safe and healthy for your dog and friendly to our environment. When you and your dog arrive for grooming the first time, you’ll be happy to see the open and safe environment for your dog. You can take a Salon Tour here. It’s important to me to take the time to get to know you, your dog and your grooming preferences. 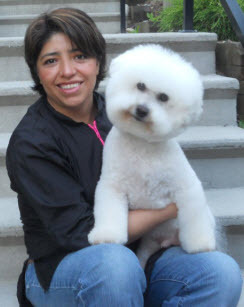 I’m always happy to share with you my professional recommendations for your pet. 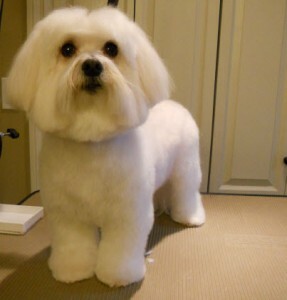 your loved one comes off the grooming table and into your loving arms right away. As noted on the right of this page, I stand behind my work 100% and personally guarantee each grooming is to your complete satisfaction or your money back. Many other dog owners have entrusted their dogs and grooming needs into my loving care. You can read some client reviews here. Give me a call any time at 778-918-9178 I’d be happy to answer your questions and check my availability for you. I look forward to meeting you and your beloved dog(s) soon.